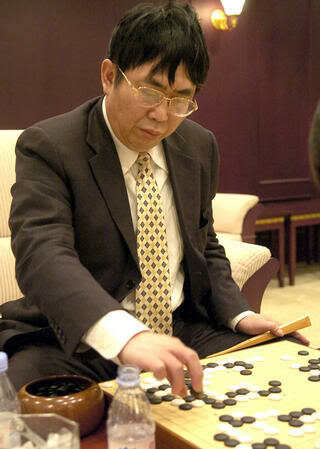 Nie Weiping (chinese simpl: 聂卫平, trad: 聶衛平; born 17 August 1952) 9-dan was for many years the strongest Go player in China. Nie won the 1st World Amateur Go Championship in 1979. Although Nie has won many Chinese titles, it is for his achievements in the first four China-Japan Supermatches (1984-1988) that he is especially famous. He won the 1st Supermatch for China by defeating Kobayashi Koichi, Kato Masao and Fujisawa Shuko, the 2nd by defeating Kataoka Satoshi, Yamashiro Hiroshi, Sakai Takeshi, Takemiya Masaki and Otake Hideo, and the 3rd by defeating Kato Masao again. In the 4th Supermatch he beat Yoda Norimoto and Awaji Shuzo before finally falling to Hane Yasumasa. This sequence of 11 successive wins against many of Japan's finest players earned him the nickname "the Iron Goalkeeper". He was widely regarded as one of the strongest players in the world. Nie had less success in the international titles which started to spring up in 1988. Although he reached the final of three such events (the 1st Ing Cup, the 3rd Fujitsu Cup and the 6th Tong Yang Securities Cup), he never managed to win one. Nie was formerly married to Kong Xiangming 8 dan. Their son Ko Reibun (Kong Lingwen in the Chinese reading) is a professional with the Nihon Ki-in. Chang Hao and Gu Li have been his pupil. A translation of Nie's book Nie Weiping on Go is published by Yutopian. Nie Weiping is profiled in the second chapter of The World of Chinese Go. Co-author with Huang Xiwen 6p of Step by Step Weiqi Classroom.